I was cleaning out part of my garage the other day and found this bohemian J.Crew top from a few years back! How crazy is it that trends can come and go!? The tassel trend is totally back in style and I am grateful for finding this top! I love the light pink color and the fun detailed embroidery along the neckline. Very summer chic! I can see myself wearing this outfit when I am on vacation(!!) in New York...which is where I'll be starting Thursday! Unfortunately it is no longer in stores, but I've linked a few other options below! 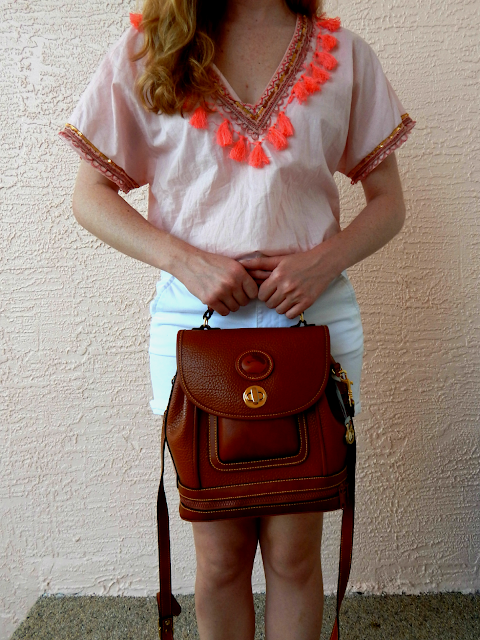 My white high-waisted shorts are a classic from American Eagle and my brown Dooney & Bourke is vintage (you have to check out this cute one for $178! It's under $200 which is great for an investment piece like I consider this bag to be). Have a fantastic day and thank you so much for visiting my blog!